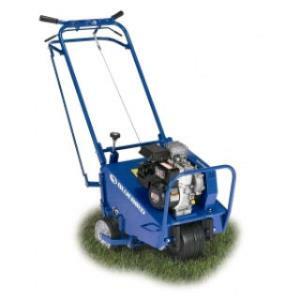 Loved by homeowners and contractors alike, the bluebird aerator is a compact machine that is easy to maneuver but also a powerful workhorse. It features a working width of 18" that is rated to aerate 20,000 square feet per hour. The handle folds into the unit, and the machine features two removable 35 lb weights as well as built-in lift handles on the side. * Please call us for any questions on our aerator bluebird rentals in Hillsdale and Ridgewood NJ.